Alt-rock titans Alter Bridge brought their battle-tested tunes to Nashville's War Memorial Auditorium on Wednesday, October 5, 2016 for a show that pleased the packed house full of fans spanning a diverse demographic. The Orlando-based quartet was only days away from releasing their fifth full-length album The Last Hero when they brought their high-flying headlining concert to the Capitol District of Music City. 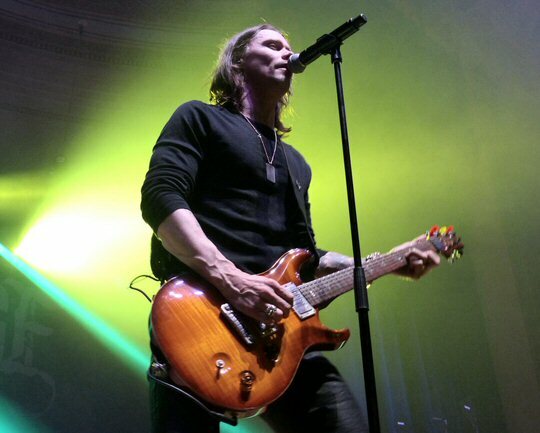 Alter Bridge played a heroic show at the War Memorial Auditorium. Alter Bridge was formed in 2004 when three-fourths of the Grammy-Award winning radio darlings of the 90's Creed disbanded. Guitarist Mark Tremonti, bassist Brian Marshall and drummer Scott Phillips hooked up with the relatively unknown at the time singer Myles Kennedy and got things started with their debut, One Day Remains. That album was written completely by Tremonti and considered by many simply the next Creed album with a new singer due to the similarity to its predecessors. However, in the ensuing decade and beyond Alter Bridge has been able to carve out their own identity as they have risen to become one of rock's most epic and dynamic bands. Nashville may not be Gotham City but we do have the Batman building dominating the local skyline. It didn't take long for Alter Bridge to dish out the KAPOW, POW and BAM courtesy of their proficient two-guitar attack and the big WHACK from the group's well-honed rhythm section. Alter Bridge features the high-powered vocal prowess of Myles Kennedy. 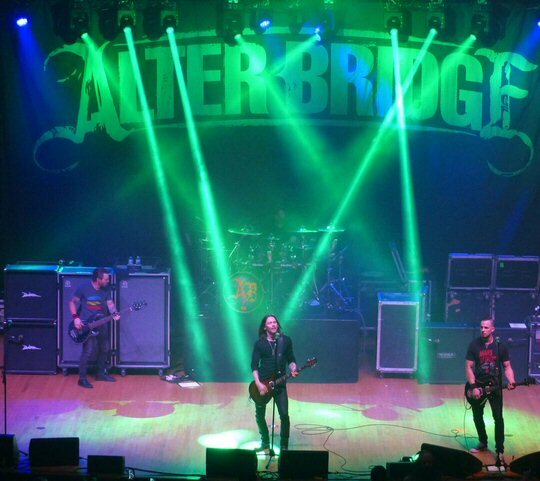 Alter Bridge took the stage around 9:40 p.m. following opening sets from tour mates Adelitas Way and 3 Pill Morning and proceeded to deliver an hour and forty minute presentation of their heavy, yet melodic musical offerings. On display was the compelling partnership that Kennedy, Tremonti and company have now perfected as they performed hard-rocking metallic songs full of hope, optimism and a keen awareness that things aren't always right in this world. "Come to Life" from their critically-acclaimed sophomore effort really got the Nashville faithful excited as they sprung to life remaining on their feet for the rest of the night. "Farther than the Sun" from the sturdy Fortress followed and shed light that this evening's performance was going to be a memorable showcase of career highlights. 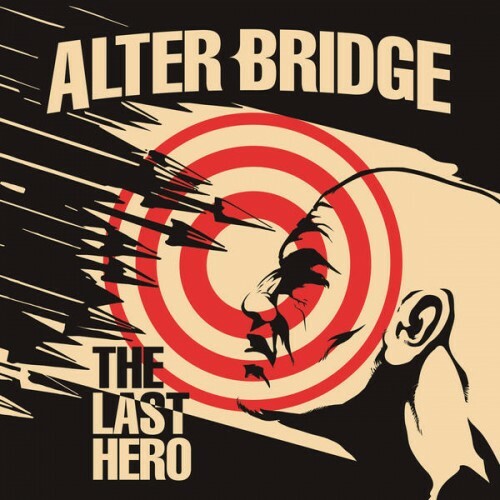 There were two debuts from the new album as "My Champion" and " Show Me a Leader" showed that Alter Bridge are still leading the pack as champions of the densely layered alternative metal sound. The guys also presented two tracks that contained nods to legendary classic groups when "Blackbird" and "Cry of Achilles" were each led off with tribute openings to The Beatles and Led Zeppelin respectively. Singer Myles Kennedy was a revelation in a live setting as he displayed his golden-throated pipes that rock legends Slash, Plant and Page have all taken notice of in recent years. At times you could understandably detect a bit of Axl Rose mixed with the lower register of an Arnel Pineda. Yet, Kennedy was his own artist especially as shown on his solo slot during the alluring and crowd pleasing emotional take on the acoustic "Watch Over You". Kennedy also killed it on guitar sharing the spotlight on lead with Tremonti throughout the show. 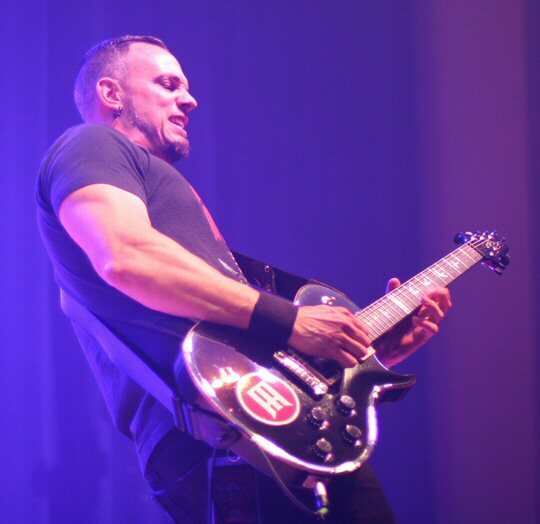 Alter Bridge features the sonic assault of guitar wizard Mark Tremonti. The historic War Memorial Auditorium located in the heart of downtown Nashville sits directly in front of the Tennessee State Capitol. Built in 1925, this exquisite room is now known for hosting many of Music City's marquee rock concerts. Upcoming events include The Fray with special guest American Authors and Mistletoe Madness feat. Rodney Atkins, Jerrod Niemann and more.